Height adjustable chassis v-maxx seat leon 1p tdi fsi cupra tfsi 05> news. This product page has been automatically translated. If you have any questions, do not hesitate to contact us. The lemar tuning car distributes products of major brands, tested and guaranteed with written documentation. Each order will be accompanied by a sale, which is in warranty on the product itself. At the time of purchase, you will need to submit your name, address, city, postal code, social security number and phone number, which will appear in the sales document. After purchase, contact us and request an order form the products you selected, compilation all required fields. The car tuning lemar will not be held responsible for errors contained in the purchase of the customer. Count on competent people working in the field with regular registration with the Chamber of Commerce and the VAT, no sellers. Who buys our products must keep the purchase invoice for the guarantee. Lemar tuning car 02712410832 p. Iva tel. 09: 00-12: 30 16: 00-19: 00 3471132301 morning 0909286579 hours after hours 20:00 afternoon mario of the cell. Adjustable suspension kit v-maxx height for seat leon 1 p.
Height adjustable trim for v-maxx seat leon 1p. Demonstration (photo demonstration of the photo). Special discounts for buying several items relating to the same car. Wanted club (conventions) and retailers with registration presentation with the chamber of commerce. V-maxx made in veicolo holland. Template: leon (1p1) 2.0 tdi dsg 01/2005 en-incl incl 2013> - leon (1p1) 2.0 fsi- 2.0 tfsi cupra en-01 / 2005-> incl 2013 - eon (1p1) 1.6 tdi- 1.9 tdi dsg 2005-01 / 2013>. Technical notes sag indication (in mm). 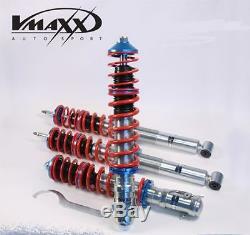 4 v-maxx coilovers threaded kit. Please note: specify if the car goes up amm. Ø 50 or 55 mm. Adjustable sport springs springs 4 kit (threaded handsets) with excellent maneuverability. V-maxx main brand made in Holland, sold in 53 countries worldwide. Choose in the v-maxx coilover = non-adjustable sports seats and v-maxx xxtreme coilover = 20 adjustment and adjustment layers all with height adjustable to the nut on the threaded rod. Year, model, displacement, kw and front and rear axles load in kg (since it is located on the label in the door or engine compartment studs). Important, please indicate in the notes when ordering. Year, model, cylinder capacity and load kg in front and rear axle (which is located on the "label in the engine compartment or on the pillars of the door). Weight (front axle) front axle weight. Rear axle weight (rear axle weight). The weight of the axles, is in the label in the engine compartment or in the port column, where is the chassis number. The weight of the axles is on the label in the engine compartment, or in the steering column door, where it is also indicated the number of the frame. 1-0000 instead of 4 zeros there is 4 front axle numbers (eg 1-0685). 2-0000 instead of 4 zeros there is a rear axle of 4 numbers (eg 1-0685). 1-0000 instead of 4 zeros, there are 4 front axles of numbers (eg 1-0685). There are 2-0000 instead of 4 zeros at the rear of 4 numbers (eg 1-0685). The lemarcartuning, not responsible for delivery delays and items damaged by the carrier, it is advisable to pre-emptively block. The lemarcartuning, assumes the entire responsibility, delivery delays and damaged objects by the carrier and can bring them in advance. Cercasi club or sellers with his vat, a close collaboration. Special discounts on the phone's arrangement. Delivery by express courier dhl. Remember to add me to your favorites list. The item "height-adjustable chassis v-maxx seat leon 1p tdi fsi cupra tfsi 05 news" is on sale since Monday, October 8, 2018. It is in the category "auto, motorcycle parts, accessories \ tuning, styling \ suspension \ other". The seller is "lemarcartuning2008" and is located in milazzo, me. This item can be shipped to the following countries: europe, australia.